French Home's traditional Laguiole design with the iconic three rivet curved handle and bee emblem are elegant and comfortable to hold. Perfect for small plates, appetizers, amuse bouche, fruit or for pies and cakes at afternoon tea or finale to dinner. 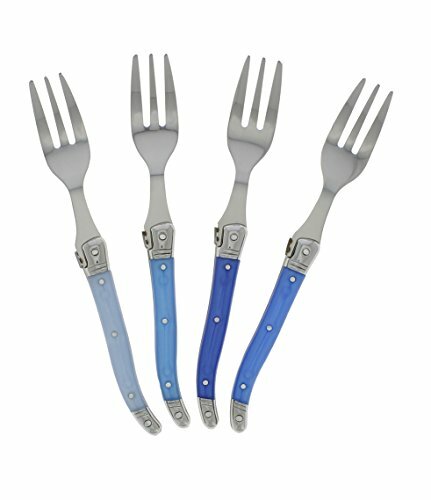 Perfectly sized at 6.5" these forks are dishwasher safe. Pair them with the French Home Laguiole coffee spoons for a perfect dessert set. Laguiole is a town in France where this style originated. The cake forks come in an attractive box making it a perfect gift for your favorite baker or anyone who likes to entertain. If you have any questions about this product by French Home, contact us by completing and submitting the form below. If you are looking for a specif part number, please include it with your message.